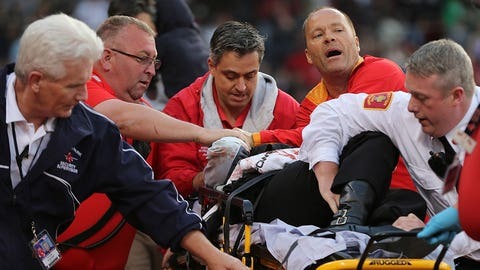 A fan is attended to by medical staff after she was hit by a broken bat during a game Friday between the Red Sox and Athletics in the second inning at Fenway Park. BOSTON — A fan hit by a broken bat at Fenway Park is expected to survive after suffering life-threatening injuries during a game between the Oakland Athletics and Boston Red Sox. Tonya Carpenter was struck in the head by the broken bat of Oakland’s Brett Lawrie on Friday night. Carpenter is now in serious condition, her family said in a statement. "Tonya’s family and loved ones are grateful to all who have reached out with thoughts and prayers but are requesting privacy at this time as Tonya recovers," Beth Israel Deaconess Medical Center Hospital said in a statement. There was a moment of reflection for Carpenter at Fenway Park before Saturday’s game between the A’s and Red Sox. Lawrie was out of the lineup, but manager Bob Melvin said it was because of a back issue, not because of any psychological effects after the incident. Friday night’s game was halted in the second inning as emergency crews tended to a bloodied Carpenter and wheeled her off the field on a stretcher. Lawrie broke his bat on a grounder and part of it hurtled a few rows into the seats between the backstop and Oakland’s dugout on the third base side. "It was violent," he said of the impact to her forehead and top of her head. "She bled a lot. A lot. I don’t think I’ve ever seen anything like that." "I’ve seen bats fly out of guys’ hands in the stands and everyone’s OK, but when one breaks like that, has jagged edges on it, anything can happen." "You have a ballpark here that’s how old, and it’s close, you have some maple bats that break. 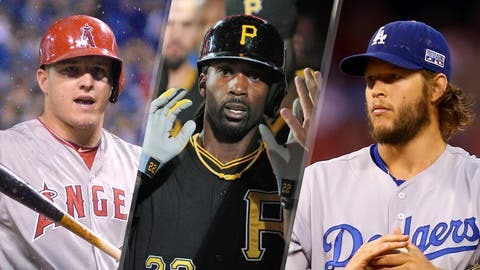 I think MLB and the players’ association have talked long and hard about how they can try to keep this from happening," Melvin said.